The future of Britain’s exit from the European Union hung in the balance on Tuesday as lawmakers prepared to vote on a divorce deal after Prime Minister Theresa May won last-minute assurances from the EU. Scrambling to plot an orderly path out of the Brexit maze just days before the United Kingdom is due to leave, May rushed to Strasbourg on Monday to secure “legally binding” assurances from European Commission head Jean-Claude Juncker. “We have secured legal changes,” May said in a late-night news conference in Strasbourg beside Juncker. Brexiteers worry the backstop, aimed at avoiding controls on the border between the British province of Northern Ireland and EU-member Ireland, could trap the United Kingdom in the EU’s orbit indefinitely. British lawmakers on Jan. 15 voted 432-202 against May’s deal, were studying the assurances with lawyers. 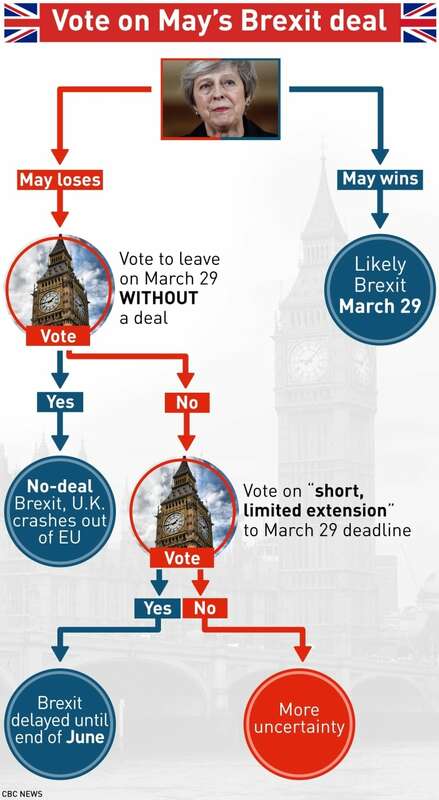 If lawmakers vote down May’s latest attempt, she has promised a vote on Wednesday on whether to leave without a deal and, if they reject that, there would be a vote on whether to ask for a limited delay to Brexit. The immediate reaction was caution from Brexit-supporting lawmakers and the Northern Irish Democratic Unionist Party (DUP) that props up her minority government. “We will be taking appropriate advice, scrutinizing the text line by line and forming our own judgment,” a DUP spokesperson said. On Tuesday, Irish Prime Minister Leo Varadkar expressed support for the proposed changes, saying they do not undermine the backstop. If the backstop comes into force and talks on the future relationship break down with no prospect of an agreement, May said the unilateral declaration she announced would make it clear there was nothing to stop London from moving to leave the backstop.